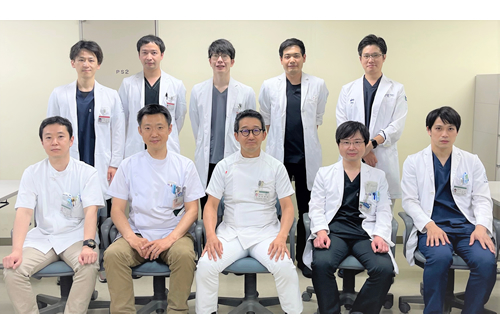 The Kobe University Orthopaedic Spine Surgery division has three faculties, four graduate school students, and residents. In our hospital, we treat severe complicated spinal diseases, including tumors, scoliosis, and osteoporosis-associated spinal deformities, working together with anesthesiologists, cardiologists, pediatricians, radiologists, physiatrists, and co-medical staffs. We attempted to find the best treatment strategy based on each patient's disease, condition, and activity. Recently, the number of our surgical cases is increasing up to approximately 300 cases/year, closely cooperating with neighboring hospitals. This enables us to treat more patients surgically without long-period waiting. We all continue to take on new challenges to rescue many patients with spinal problems by optimal treatments. The primary focus of our clinical studies is to elucidate the natural course and prognosis of spinal diseases, to clarify outcomes of surgical and non-surgical treatments, and to develop new therapeutic devices and strategies. We reported the natural course and predictive risk factors of cervical spine instability in patients with rheumatoid arthritis, winning a prestigious international award, the 2nd Clinical Research Paper Award at the 43rd annual meeting of Cervical Spine Research Society (San Diego, CA, 2015). We then performed a prospective follow-up study of patients with spinal metastasis. Our reports describing the outcomes and socioeconomic impacts of surgical treatment both received the reputational Best Clinical Research Paper Award at the 122nd and 125th meetings of the Central Japan Association of Orthopaedic Surgery and Traumatology (Okayama, 2014 and Nagoya, 2015), respectively. In addition, our study regarding the efficacy of an electronic conductivity device in severe syndromic scoliosis surgery was selected as the Best Poster Award at the 49th annual meeting of Japanese Scoliosis Society (Niigata, 2015). Furthermore, we have multiple ongoing studies of spinal metastasis, intradural tumors, and osteoporosis-induced vertebral fractures and kyphoscoliotic deformities. For years, we are also developing a new, less-invasive treatment device for lumbar spinal canal stenosis, a prototype of which was previously reported internationally (Eur Spine J, 2012). After careful basic trials of the device, we are ready to start the clinical trial shortly. We continue clinical research to find the best practical treatment for spinal diseases. We are consistently conducting basic research for intervertebral disc pathology. Our primary focus is to reveal the mechanism of disc diseases and to provide insights into new biological therapy. The intervertebral disc a unique structure consisting of the nucleus pulposus encapsulated by the annulus fibrosus and endplates. The disc is the largest avascular organ in the body. Therefore, additional nutrient deprivation associated with injury, smoking, and/or aging is a suspected contributor to disc degeneration. We studied biological agents, peptides, and proteins to reduce cellular stress based on the anatomical characteristics and limited nutrition of the disc-SIRT1 (Arthritis Res Ther, 2011, 2015), integrin antagonists (Spine J, 2015), and adiponectin (J Orthop Surg Res, 2016). We are testing these treatments in vivo for future clinical trials. To study the disease mechanism and assess effects of new biological treatments, the development of animal models is essential. Mechanical loading is a major induction method to disc degeneration. To mimic human spontaneous chronic disc degeneration, we developed and reported a rat tail model of disc degeneration induced by sustained static compression (J Orthop Res, 2010, 2011, Arthritis Res Ther 2012, 2014). Furthermore, a modified version of this model, better suited to observe earlier events of disc degeneration, was also established (J Orthop Res 2014) and awarded the Best Basic Research Paper Award at the 120th and meeting of the Central Japan Association of Orthopaedic Surgery and Traumatology (Wakayama, 2013). We have developed an ex-vivo dynamic compression model (Spine J, 2015) more recently in collaboration with Rush University (Chicago, IL, USA), University of California San Diego (San Diego, CA, USA), and Doshisha University (Kyoto, Japan). These animal models will facilitate the future development of molecular treatments for disc disorders. We proposed the disc as an immune-privileged site based on the anatomical feature and also the expression of apoptosis-inducing Fas ligand in the nucleus pulposus (Spine [Phila Pa 1976], 2002, 2004). We further clarified the interaction between the nucleus pulposus and macrophages in an animal model of herniated discs (Arthritis Rheum, 2012). Evidence regarding Fas ligand and macrophage infiltration can provide useful information to understand the pathophysiology of herniated disc disease. We are conducting new studies to develop biological treatments. (1) Ito M, Yurube T, Kakutani K, Maeno K, Takada T, Terashima Y, Kakiuchi Y, Takeoka Y, Miyazaki S, Kuroda R, Nishida K. Selective interference of mTORC1/RAPTOR protects against human disc cellular apoptosis, senescence, and extracellular matrix catabolism with Akt and autophagy induction. Osteoarthritis Cartilage. 2017 Dec;25(12):2134-2146. (2) Kakutani K, Sakai Y, Maeno K, Takada T, Yurube T, Kurakawa T, Miyazaki S, Terashima Y, Ito M, Hara H, Kawamoto T, Ejima Y, Sakashita A, Kiyota N, Kizawa Y, Sasaki R, Akisue T, Minami H, Kuroda R, Kurosaka M, Nishida K. Prospective Cohort Study of Performance Status and Activities of Daily Living After Surgery for Spinal Metastasis. Clin Spine Surg. 2017 Oct;30(8):E1026-E1032. (3) Kobayashi K, Imagama S, Ando K, Ishiguro N, Yamashita M, Eguchi Y, Matsumoto M, Ishii K, Hikata T, Seki S, Terai H, Suzuki A, Tamai K, Aramomi M, Ishikawa T, Kimura A, Inoue H, Inoue G, Miyagi M, Saito W, Yamada K, Hongo M, Nishimura H, Suzuki H, Nakano A, Watanabe K, Chikuda H, Ohya J, Aoki Y, Shimizu M, Futatsugi T, Mukaiyama K, Hasegawa M, Kiyasu K, Iizuka H, Iizuka Y, Kobayashi R, Nishida K, Kakutani K, Nakajima H, Murakami H, Demura S, Kato S, Yoshioka K, Namikawa T, Watanabe K, Nakanishi K, Nakagawa Y, Yoshimoto M, Fujiwara H, Nishida N, Imajo Y, Yamazaki M, Sakane M, Abe T, Fujii K, Kaito T, Furuya T, Orita S, Ohtori S. Complications Associated With Spine Surgery in Patients Aged 80 Years or Older: Japan Association of Spine Surgeons with Ambition (JASA) Multicenter Study. Global Spine J. 2017 Oct;7(7):636-641. (4) Kobayashi K, Imagama S, Ando K, Ishiguro N, Yamashita M, Eguchi Y, Matsumoto M, Ishii K, Hikata T, Seki S, Terai H, Suzuki A, Tamai K, Aramomi M, Ishikawa T, Kimura A, Inoue H, Inoue G, Miyagi M, Saito W, Yamada K, Hongo M, Matsuoka Y, Suzuki H, Nakano A, Watanabe K, Chikuda H, Ohya J, Aoki Y, Shimizu M, Futatsugi T, Mukaiyama K, Hasegawa M, Kiyasu K, Iizuka H, Iizuka Y, Kobayashi R, Nishida K, Kakutani K, Nakajima H, Murakami H, Demura S, Kato S, Yoshioka K, Namikawa T, Watanabe K, Nakanishi K, Nakagawa Y, Yoshimoto M, Fujiwara H, Nishida N, Imajo Y, Yamazaki M, Sakane M, Abe T, Fujii K, Kaito T, Furuya T, Orita S, Ohtori S. Risk Factors for Delirium After Spine Surgery in Extremely Elderly Patients Aged 80 Years or Older and Review of the Literature: Japan Association of Spine Surgeons with Ambition Multicenter Study. Global Spine J. 2017 Sep;7(6):560-566. (5) Vaudreuil N, Kadow T, Yurube T, Hartman R, Ngo K, Dong Q, Pohl P, Coelho JP, Kang J, Vo N, Sowa G. NSAID use in intervertebral disc degeneration: what are the effects on matrix homeostasis in vivo? Spine J. 2017 Aug;17(8):1163-1170. (6) Wang T, Ishihara T, Kono A, Yoshida N, Akasaka H, Mukumoto N, Yada R, Ejima Y, Yoshida K, Miyawaki D, Kakutani K, Nishida K, Negi N, Minami T, Aoyama Y, Takahashi S, Sasaki R. Application of dual-energy CT to suppression of metal artefact caused by pedicle screw fixation in radiotherapy: a feasibility study using original phantom. Phys Med Biol. 2017 Jul 17;62(15):6226-6245. (7) Takayama K, Kawakami Y, Lavasani M, Mu X, Cummins JH, Yurube T, Kuroda R, Kurosaka M, Fu FH, Robbins PD, Niedernhofer LJ, Huard J. mTOR signaling plays a critical role in the defects observed in muscle-derived stem/progenitor cells isolated from a murine model of accelerated aging. J Orthop Res. 2017 Jul;35(7):1375-1382. (8) Miyazaki S, Kakutani K, Sakai Y, Ejima Y, Maeno K, Takada T, Yurube T, Terashima Y, Ito M, Kakiuchi Y, Takeoka Y, Hara H, Kawamoto T, Sakashita A, Okada T, Kiyota N, Kizawa Y, Sasaki R, Akisue T, Minami H, Kuroda R, Nishida K. Quality of life and cost-utility of surgical treatment for patients with spinal metastases: prospective cohort study. Int Orthop. 2017 Jun;41(6):1265-1271. (9) Terashima Y, Yurube T, Hirata H, Sugiyama D, Sumi M; Hyogo Organization of Spinal Disorders. Predictive risk factors of cervical spine instabilities in rheumatoid arthritis: a prospective multicenter over 10-year cohort study. Spine (Phila Pa 1976). 2017 Apr 15;42(8):556-564. (1) Terashima Y, Kakutani K, Yurube T, Takada T, Maeno K, Hirata H, Miyazaki S, Ito M, Kakiuchi Y, Takeoka Y, Kuroda R, Nishida K. Expression of adiponectin receptors in human and rat intervertebral disc cells and changes in receptor expression during disc degeneration using a rat tail temporary static compression model. J Orthop Surg Res 11(1):147, 2017. (10) Pohl PH, Lozito TP, Cuperman T, Yurube T, Moon HJ, Ngo K, Tuan RS, Croix CS, Sowa GA, Rodrigues LM, Kang JD, Vo NV. Catabolic effects of endothelial cell-derived microparticles on disc cells: Implications in intervertebral disc neovascularization and degeneration. J Orthop Res 34(8):1466-74, 2016. (11) Miyazaki S, Kakutani K, Maeno K, Takada T, Yurube T, Kurosaka M, Nishida K. Surgical debridement with retention of spinal instrumentation and long-term antimicrobial therapy for multidrug-resistant surgical site infections after spinal surgery: a case series. Int Orthop 40(6):1171-7, 2016. (12) Miyazaki S, Kakutani K, Yurube T, Maeno K, Takada T, Zhang Z, Kurakawa T, Terashima Y, Ito M, Ueha T, Matsushita T, Kuroda R, Kurosaka M, Nishida K. Recombinant human SIRT1 protects against nutrient deprivation-induced mitochondrial apoptosis through autophagy induction in human intervertebral disc nucleus pulposus cells. Arthritis Res Ther 17:R253, 2015. (13) Kurakawa T, Kakutani K, Morita Y, Kato Y, Yurube T, Hirata H, Miyazaki S, Terashima Y, Maeno K, Takada T, Doita M, Kurosaka M, Inoue N, Masuda K, Nishida K. Functional impact of integrin α5β1 on the homeostasis of intervertebral discs: a study of mechanotransduction pathways using a novel dynamic loading organ culture system. Spine J 15(3):417-26, 2015. (14) Hartman RA, Yurube T, Ngo K, Merzlak NE, Debski RE, Brown BN, Kang JD, Sowa GA. Biological responses to flexion/extension in spinal segments ex-vivo. J Orthop Res 33(8):1255-64, 2015. (15) Pohl PHI, Tamaoki MJ, Rodrigues LM, Radcliff KE, Yurube T, Kang JD, Belloti JC. Posterior surgical approach procedures for cervical myelopathy (Protocol). Cochrane Database Syst Rev 2015 Issue 3, 2015. (16) Yurube T, Sumi M, Nishida K, Miyamoto H, Kohyama K, Matsubara T, Miura Y, Hirata H, Sugiyama D, Doita M. Accelerated development of cervical spine instabilities in rheumatoid arthritis: a prospective minimum 5-year cohort study. PLoS One 9(2):e88970, 2014. (17) Yurube T, Hirata H, Kakutani K, Maeno K, Takada T, Zhang Z, Takayama K, Matsushita T, Kuroda R, Kurosaka M, Nishida K. Notochordal cell disappearance and modes of apoptotic cell death in a rat tail static compression-induced disc degeneration model. Arthritis Res Ther 16(1):R31, 2014. (18) Moon HJ, Yurube T, Lozito TP, Pohl P, Hartman RA, Sowa GA, Kang JD, Vo NV. Effects of secreted factors in culture medium of annulus fibrosus cells on microvascular endothelial cells: elucidating the possible pathomechanisms of matrix degradation and nerve in-growth in disc degeneration. Osteoarthritis Cartilage 22(2):344-54, 2014. (19) Hirata H, Yurube T, Kakutani K, Maeno K, Takada T, Yamamoto J, Kurakawa T, Akisue T, Kuroda R, Kurosaka M, Nishida K. A rat tail temporary static compression model reproduces different stages of intervertebral disc degeneration with decreased notochordal cell phenotype. J Orthop Res 32(3):455-63, 2014. (20) Miyamoto H, Maeno K, Uno K, Kakutani K, Nishida K, Sumi M. Outcomes of surgical intervention for cervical spondylotic myelopathy accompanying local kyphosis (comparison between laminoplasty alone and posterior reconstruction surgery using the screw-rod system). Eur Spine J 23(2):341-46, 2014. (21) Kakutani K, Doita M, Yoshikawa M, Okamoto K, Maeno K, Yurube T, Sha N, Kurosaka M, Nishida K. C1 laminectomy for retro-odontoid pseudotumor without atlantoaxial subluxation: review of seven consecutive cases. Eur Spine J 22(5):1119-26, 2013. (22) Nishida K, Kakutani K, Maeno K, Takada T, Yurube T, Kuroda R, Kurosaka M. Efficacy of hemostasis for epidural venous plexus and safety for neural structure using soft coagulation system in spinal surgery: a laboratory investigation using a porcine model. J Spinal Disord Tech 26(7):E281-5, 2013. (23) Vo NV, Hartman RA, Yurube T, Jacobs LJ, Sowa GA, Kang JD. Expression and regulation of metalloproteinases and their inhibitors in intervertebral disc aging and degeneration. Spine J 13(3):331-341, 2013. (24) Yamamoto J, Maeno K, Takada T, Kakutani K, Yurube T, Zhang Z, Hirata H, Kurakawa T, Sakai D, Mochida J, Doita M, Kurosaka M, Nishida K. Fas ligand plays an important role for the production of pro-inflammatory cytokines in intervertebral disc nucleus pulposus cells. J Orthop Res 31(4):608-15, 2013. (25) Fukuda K, Ozaki T, Tsumura N, Sengoku A, Nomi M, Yanagiuchi A, Nishida K, Kuroda R, Iguchi T. Neurogenic bladder associated with pure cervical spondylotic myelopathy: clinical characteristics and recovery after surgery. Spine (Phila Pa 1976) 38(2):104-11, 2013. (26) Yurube T, Sumi M, Nishida K, Miyamoto H, Kohyama K, Matsubara T, Miura Y, Sugiyama D, Doita M. Incidence and aggravation of cervical spine instabilities in rheumatoid arthritis: a prospective minimum 5-year follow-up study of patients initially without cervical involvement. Spine (Phila Pa 1976) 37(26):2136-2144, 2012. (27) Iguchi T, Nishida K, Ozaki T, Kitagawa A, Tsumura N, Kakutani K, Yurube T, Kuroda R. Grade three disc degeneration is a critical stage for anterior spondylolisthesis in lumbar spine. Eur Spine J 21(11):2134-2139, 2012. (28) Yurube T, Takada T, Suzuki T, Kakutani K, Maeno K, Doita M, Kurosaka M, Nishida K. Rat tail static compression model mimics extracellular matrix metabolic imbalances of matrix metalloproteinases, aggrecanases, and tissue inhibitors of metalloproteinases in intervertebral disc degeneration. Arthritis Res Ther 14(2):R51, 2012. (29) Takada T, Nishida K, Maeno K, Kakutani K, Yurube T, Doita M, Kurosaka M. Intervertebral disc and macrophage interaction induces mechanical hyperalgesia and cytokine production in a herniated disc model in rats. Arthritis Rheum 64(8):2601-10, 2012. (30) Nishida K, Doita M, Kakutani K, Maeno K, Yurube T, Kurosaka M. Development of percutaneously insertable/removable interspinous process spacer for treatment of posture-dependent lumbar spinal-canal stenosis: preclinical feasibility study using porcine model. Eur Spine J 21(6):1178-85, 2012. (31) Hamamoto H, Miyamoto H, Doita M, Takada T, Nishida K, Kurosaka M. Capability of nondegenerated and degenerated discs in producing inflammatory agents with or without macrophage interaction. Spine (Phila Pa 1976) 37(3):161-7, 2012. (1) Yurube T, Kakutani K, Okamoto K, Manabe M, Maeno K, Yoshikawa M, Sha N, Kuroda R, Nishida K. Lumbar spondylolysis: A report of four cases from two generations of a family. J Orthop Surg (Hong Kong). 2017 May-Aug;25(2):2309499017713917. (2) Kurosawa T, Yurube T, Kakutani K, Maeno K, Uno K, Kurosaka M, Nishida K. Thoracic compression myelopathy due to the progression of dystrophic scoliosis, the presence of a paraspinal tumor, and high and excessive amplitude movement of the shoulder: a case report of neurofibromatosis type 1. J Orthop Surg (Hong Kong). 2017 Jan;25(1):2309499016684726. (3) Takemori T, Kakutani K, Maeno K, Akisue T, Kurosaka M, Nishida K. Symptomatic perineural cyst: report of two cases treated with cyst-subarachnoid shunts. Eur Spine J 23(2):267-70, 2015. (4) Tsutsumi N, Kojima Y, Nishida K, Maeno K, Kakutani K, Kawakami F, Kanzawa M, Itoh T, Otsuki N, Nibu K. Surgical treatment for recurrent solitary fibrous tumor invading atlas. Head Neck 36(11);E121-4, 2014. Passion pushes you to overcome what state-of-the-art medical care cannot. Copyright (C) 2018 Kobe University Orthopaedic Surgery All Rights Reserved.